South Sudan Has Stopped Transmission Of The Horrific Parasite Guinea Worm : Goats and Soda Despite an ongoing civil war, South Sudan has successfully stopped transmission of the horrific parasite. The milestone means the worm is circulating in only three countries. The white, threadlike Guinea worm emerges from an infected foot. "I come from an area that had the most Guinea worm," South Sudan's Minister of Health, Dr. Riek Gai Kok, said at a news conference. "I never thought — even one time — that the area would be free of Guinea worm, let alone all of South Sudan would be." "But today that dream has come true," he added. 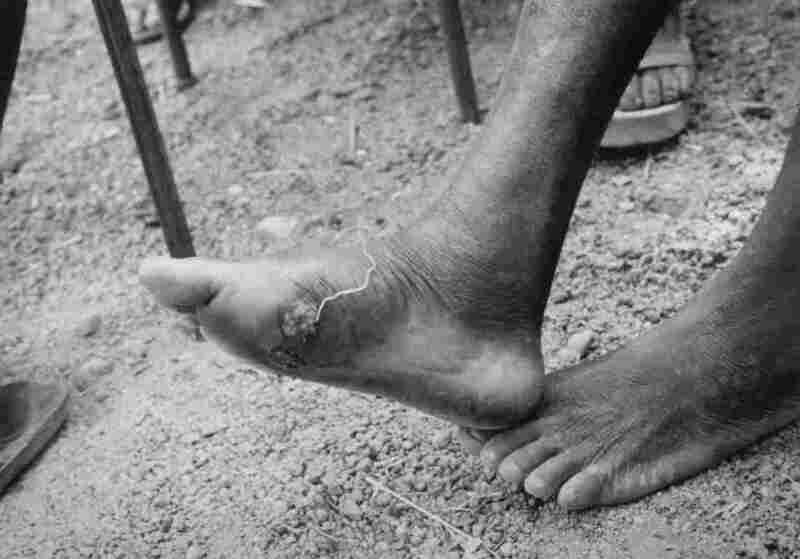 The international effort to eradicate Guinea worm has been a huge success. Back in the mid-'80s, more than 3 million people were catching the parasite each year. Now Guinea worm is circulating in only three countries: Ethiopia, Mali and Chad. Last year, there were only 30 human cases worldwide. But to eradicate the worm, health workers also have to stop transmission in animals. Last year, there were nearly a thousand cases in dogs and cats in Chad and Mali. Guinea worm is a horrific infection. First, a painful blister starts to form on the skin. Then a thin, white worm — up to 3 feet long — emerges from the blister over the course of a few weeks. It is an incredibly painful process and temporarily handicaps a person while he or she waits for the worm to come out of the skin. People catch Guinea worm by drinking contaminated water. Simply filtering drinking water can stop transmission of the parasite. An infected person can also stop the spread of the parasite by keeping the emerging worm away from water. When the worm touches water, it releases tens of thousands of baby worms and contaminates the whole body of water. Back in 2006, South Sudan reported more than 20,000 cases, making it the third hardest hit country in the world. Only Nigeria and Uganda had reported higher annual cases, at about 650,000 and 126,000, respectively. "This an incredible story, given all of the challenges that South Sudan has faced, especially the ongoing conflict," says Dr. Sharon Roy of the Centers for Disease Control and Prevention, who leads an international team working on Guinea worm eradication. Former President Jimmy Carter has led a massive campaign to eradicate the worm. "I'd like for the last Guinea worm to die before I do," he told reporters. Sudan was especially challenging. Civil war has plagued the region since the 1960s. To begin the eradication program in the area, Carter had to negotiate a special "Guinea worm cease-fire" back in 1995. And just a few years ago, the Carter Center had to evacuate its staff from the country because of violence. "If South Sudan can stop Guinea worm, Chad can do it. Mali can do it. Ethiopia can do it, too," Roy says. "It's really an amazing accomplishment."